'Where do you pray?’ probably seems a rather odd question. It isn’t the sort of thing polite British people go round asking. In Malawi though it’s quite a common question; it probably just means something a bit different from what we might expect. In our Western individualist mind-set, ‘where do you pray?’ probably sounds like a question about the location where you, as a private individual, privately and individually pray. But in Malawi when someone asks ‘where do you pray?’ they’re not thinking in quite the same way. Instead, roughly translated to the way we speak in the West, they mean ‘what church do you go to?’ The question about prayer is answered first and foremost in a corporate way. After all, Jesus did teach us to pray ‘OUR Father’. But today I’m not really thinking in either the western or the Malawian way about the question. 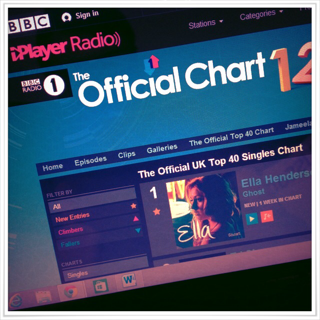 This week’s number one is Ella Henderson’s ‘Ghost’ and, perhaps unusually for a UK No. 1, prayer is a key theme in the song. ‘I keep going to the river to pray / ‘Cos I need something that can wash out the pain’. So ‘where do you pray?’: Ghost’s answer is at the river. Well a river’s as good a place as any to pray, I suppose. It’s even a place with some biblical precedent, you could say. Yet despite that, Ghost’s answer is the wrong answer! How could that be? If the river is a perfectly valid place to pray, then how can the song be misleading us about where to pray? All because of what happens at the river. ‘I keep going to the river to pray / ‘Cos I need something that can wash out the pain.’ Going to the river in the song is all about what you can do to fix yourself. It makes prayer about what you do, how you can make yourself feel better. It turns prayer into a mechanism for achieving our ends. And it places the efficacy of prayer squarely on our shoulders. I have to keep going to the river if I want to keep the pain away. Prayer becomes about me doing it right. Am I in the right place, the right posture, using the right words? ‘The river’ then is rather a burdensome place to pray. In fact, ultimately, it’s a place where I’m trying to make atonement for myself through my diligence in prayer: a place of self-salvation. But where can I go instead? Is there an alternative place to pray? Yes. Yes, there is. A much better place. A place where prayer is a delight, rather than a burden. A place where it doesn’t depend on where I go, whether I sit, stand or kneel, or which words I use. So, where is this place of prayer? In Jesus. You see, the God we come to in prayer is the Triune God. Which means we’re not alone; we’re not trying to figure out how to climb up to Him to get Him to hear and listen. Instead He has come down to us in Jesus. Jesus is the One Mediator between God and man, so that means that it’s only in Jesus that we meet with God. And so Jesus is the true place of prayer. How does that work? After all, Jesus has ascended to the right hand of the Father, and we’re down here. But, through faith, the Holy Spirit unites us to Jesus. The Holy Spirit is the invisible bond between every believer and Jesus Christ Himself. So we don’t have to go searching for a special place where Jesus is in order to pray. If we trust in Him, we’re already in Him. And in Him we are in the true place of prayer. And in Jesus is a much better place to pray than Ghost’s river. For, in Jesus, we’re united to the One who has already done it all to wash us from sin and guilt, and ultimately, when He returns to wipe away every tear, from pain as well. In Jesus, we stand before the Father in His Well-Beloved Son, knowing that we share in their relationship; we share in the love the Father has for His Son. So we know that our prayers are heard. And more than that, we know that the Father delights both to hear our prayers and to answer them. And in Jesus, we pray through our great Mediator, Intercessor and High Priest; our prayers get to the Father through Him. So we know that Jesus cleanses, purifies and perfects our prayers and presents them spotless before the Father. So that means in Jesus prayer isn’t about what I do to get rid of my sin and pain, but about what He has done. In Jesus prayer isn’t about me trying to earn a relationship with God, but about the Father and Son sharing their relationship with me through the Spirit. In Jesus prayer isn’t about me trying to get a hearing, but about coming in the confidence that God delights to listen. In Jesus prayer isn’t about me doing it right, but resting in Christ and trusting Him to clean up my messy prayers. Jesus takes the burden out of prayer. In Him prayer’s about delighting in the love and fellowship of the Father, Son and Holy Spirit, a relationship into which He brings us. In Jesus prayer’s about enjoying the Trinity. So, where do you pray? At the river or in Jesus?